If you ask IT people if you should switch off your computer at night, you will get different responses. Here are our reasons as to why you should switch off your computers. Most of these have been validated through personal experiences. The most obvious – it wastes electricity – most computers consume more power than several light bulbs. Before you say that standby uses less power, PC’s are still more susceptible to power surges, lightning damage, possible overheating and hardware malfunction – even in standby mode. It poses a possible fire hazard if a fan stops working or maybe an insect crawls into the unit and shorts something out while you are not there to notice it – or alternatively, a device may malfunction and components inside the PC may overheat. 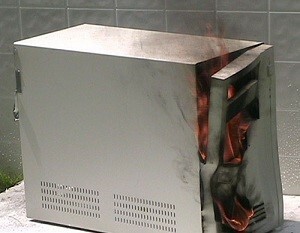 We have recently seen first-hand how a computer can start a fire. Thieves can see and/or hear PC’s easier and also see around the office easier when they’re on at night. A simple LED in a dark room can be seen from quote a distance and also illuminates a dark room quite a bit at night. Might seem like silly advice, but with break-ins as high as they are in South Africa, you really don’t want to give any thief an advantage. Computers generally work better and faster from a fresh restart in the morning. When you are away from the PC, anything could happen, a water pipe or geyser may burst, the roof could leak from heavy rain and short out the components. Rather leave it off. Odds are that if it is off when it gets water on it, you will just need to wait for it to dry out before you switch it on and although the chemical residues in the water will probably do permanent damage, you should at least have enough time to get a data backup. If it is on, however, components will probably short out and data recovery will be harder and more expensive. Less chance of recovering data if a drive crashes when you are not there and is left on for a prolonged period. The longer you leave a defective drive on, usually the worse the damage becomes. It is always a good idea the moment you notice your computer malfunctioning or slow down to make a backup. This may not be possible if the drive crashes during the night. Some programs and documents will not have their data backed up correctly via the server backup if you leave them open on your computer as they are considered “open files” and may be skipped. In addition, some programs on the server perform critical maintenance at night that could cause corruption if you leave programs open and possibly make your computer unstable when you attempt to use it in the morning causing loss of work. Many of our colleagues may scoff at this, but they are not aware of our first-hand experience with some of the new generation of remote desktop malware and root-kits. Leaving your computer on leaves it more susceptible to hackers. If your computer is on, and you get hacked while connected to the network your entire computer and network could be open to the outside world. You may notice performance issues and anomalies while you are working on the PC during the day and report them, but at night, the hacker is free to peruse things, plant a mass-mailing worm and basically cause chaos at his leisure. Well, there you have it! Good reasons to leave your computer off at night. This entry was posted on 9th August 2015 at 07:52 and is filed under BLOG Posts. You can follow any responses to this entry through the RSS 2.0 feed.